The 2015 Big 12 Basketball Tournament sponsored by Phillips 66 is scheduled to take place between March 11th and March 14th, 2015. We have published a printable Big 12 Tournament bracket that you can use to follow the game play this postseason. The tournament will be played at the Sprint Center located in Kansas City, Missouri, and the winner of the tournament will earn a spot in the 2015 NCAA Men’s Basketball Tournament. Although the Kansas Jayhawks won the regular season title, they are entering the postseason possibly down three players at the start of tourney play. It will be interesting to see which of the many strong teams in the conference come out on top as March Madness begins. The finalized Big 12 basketball tournament schedule is out. 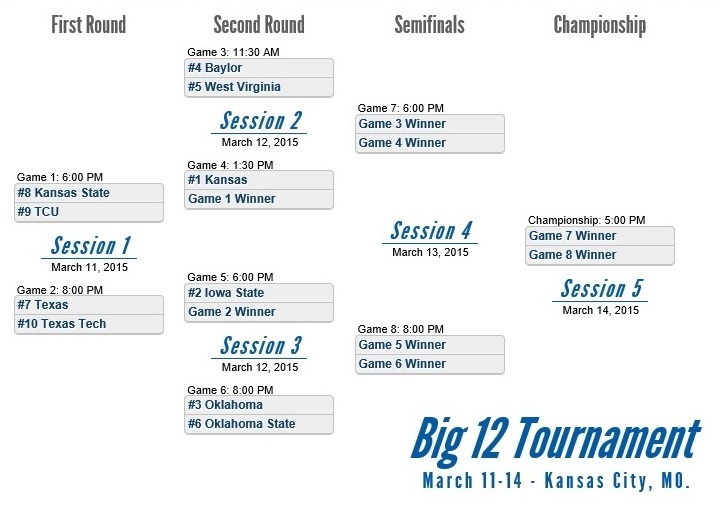 We have posted a printable 2015 Big 12 Tournament Bracket for you to use to follow the games. You can also get a jump start on March Madness by checking out our 2015 NCAA Men’s Basketball Tournament Bracket.